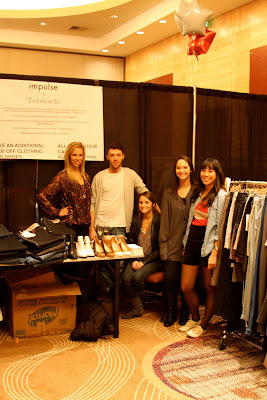 Here are a few photos of my favorite booths at the Boutique Culture Warehouse Sale at Olive 8. I really like the concept behind this event and look forward to seeing how it evolves each time it comes around. It was a great to shop locally all in one spot and at clearance prices. And after attending I can confidently say that all shopping should include a mimosa/other delicious champagne drink. CMRTYZ- I picked up great t-shirt from these guys. If I recall correctly they told me that the image on the shirt I purchased is from a Dead Ghosts gig poster. It was hard to pick. I loved all the shirt designs. Impulse Boutique- Gorgeous shoes that were unfortunately one size too small for me and insanely good prices on Why Red and Stella McCartney Jeans. The Boutique Culture booth was full of coats for under $150. I picked up a navy blue velvet RVCA trench coat for only $68. Frost Donuts to accompany the mimosas. I also had a chance to chat with one of the event sponsors Adam Sinding of the wonderful street style site Le 21eme Arrondissement. He had lots of great suggestions for using my incredibly complicated Canon. I'm now inspired to take more time to learn about all the functions it has to offer that I don't know a thing about. Thanks Adam!